A visit to Mt. 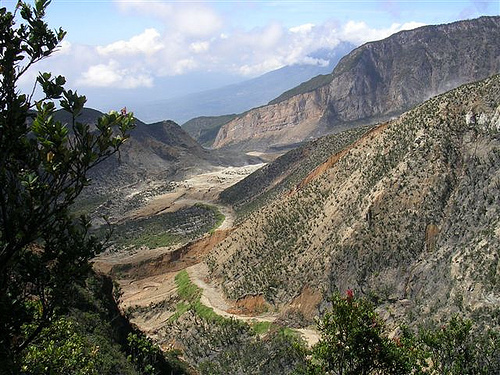 Papandayan is one of the most spectacular outings to an active volcano you can make. 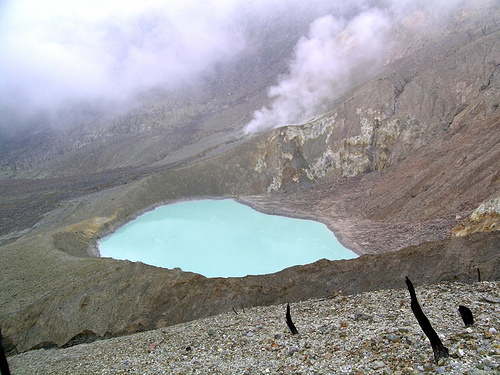 Golden sulphur crystals, hissing steam, boiling mud and water, blue and black creeks, all set in a largecrater with a commanding view over the Garut Plain make this outing an unforget- table experience. You can easily combine a visit to Mt. Papandayan with a weekend in or near Garut. Also, you can make it a one-day outing from Bandung, in which case you need a good seven to eight hours for the round trip. From Cipanas, expect a round trip to the Mt. 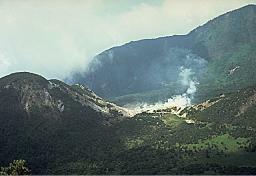 Papandayan crater to take three to four hours. 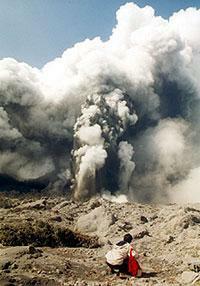 MOUNT PAPANDAYAN NATIONAL PARK : Mount Papandayan is a complex stratovolcano, located in West Java, Indonesia. 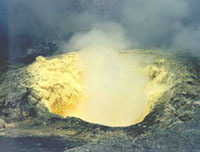 At the summit, there are four large craters, and it contains active fumarole fields. 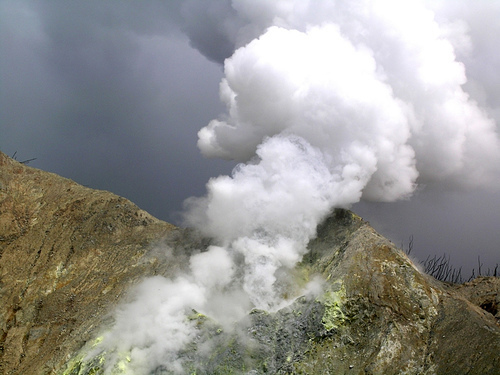 The 1772 eruption has truncated the volcano into a broad shape with two peaks and a flat 1.1 km wide of Alun-Alun crater in the middle. It looks like a twin volcano. One of the peaks is called Papandayan and the other is Mount Puntang. This interesting place lies in the border of the Bandung and Garut regencies, about seventy kilometers south of Bandung and about 19,25 km from Garut. It is one if the most spectacular volcanoes in this province and the top of the mountain are easily reaches, because there are special road leading to the crater. Mount Papandayans crater is probably one of the most spectacular mountain scenes on Java Island.There is a Cangkuang temple situated by Cangkuang Lake, which was a major discovery of archaeological value as it was the first of its kind found in West Java, dating back to the 8th century. 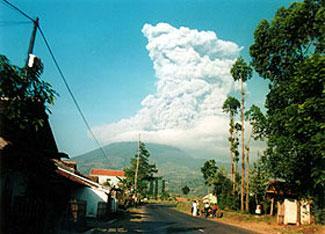 This volcano is situated 17 km from Garut or 50 km from Bandung. Access to the mountain is easy with any vehicle. Public buses take you only to within 9 km of the crater, so you either have to walk the rest of the way or take an ojek (private motorbike with driver). 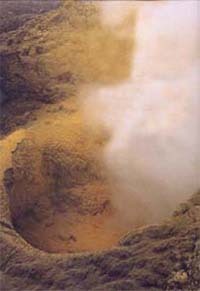 Though you can drive directly to the rim of the crater, keep in mind that your safety is not guaranteed—hot steam and boiling water and mud can scald you badly, and many of the sharp-edged rocks are rather loose. Do be careful. There are two routes to Mt. 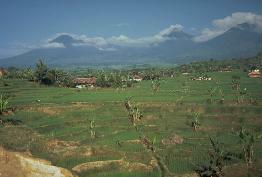 Papandayan: one from the Garut area in the east and the other from the west via Pengalengan. Note that the two routes do not connect—not even a jeep can drive the 1 km across the crater. maksudnya jarak dari Garut ke mana?